I participated in a campaign on behalf of Influence Central for Cirque du Soleil. I received tickets to Amaluna to facilitate my post as well as a promotional item to thank me for participating. As always, all views are mine. Since we saw our first Cirque du Soleil show more than five years ago, my husband and I have been huge fans. We have bought tickets nearly every year since and during a recent trip to Las Vegas with our girls, we took them to their first Cirque du Soleil show. I was so excited to see the latest production ‘AMALUNA’ that premieres in Miami in December. Check out our giveaway below for a chance to win a Cirque du Soleil gift card! Amaluna invites the audience to a mysterious island governed by Goddesses and guided by the cycles of the moon. Amaluna is a fusion of the words ama, which refers to “mother” in many languages, and luna, which means “moon”; a symbol of femininity that evokes both the mother-daughter relationship and the idea of goddess and protector of the planet. Amaluna also is the name of the mysterious island where this magical story unfolds. Cirque du Soleil tickets are a great holiday gift for any family member or friend. Especially for those ‘difficult to satisfy’ personalities (we all have one among our amigos and familia!) a unique show with amazing music and acrobats could be a great option. Their queen, Prospera, directs her daughter’s coming-of-age ceremony in a rite that honors femininity, renewal,rebirth and balance which marks the passing of these insights and values from one generation to the next. Part of what I loved most about the show was the amount of female performers I saw – including the all-female band! I found out that for the first time in Cirque du Soleil’s history, Amaluna features a cast that comprises 70% women. The music truly is extraordinary but then again, I’m a girl that owns three Cirque du Soleil albums because the music truly resonates with me. 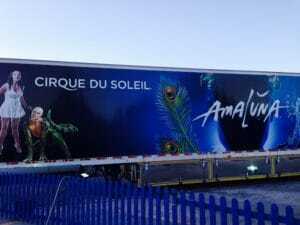 According to the show’s Creative Director Fernand Rainville “Amaluna is a tribute to the work and voice of women” and it shows. My daughters were mesmerized and couldn’t stop talking about it at intermission and following the show. Their favorite parts: the beautiful costumes and colors, the trapeze and a phenomenal acrobatics component that includes driving into a water-filled dome. We’re excited to share this unique opportunity with our readers and invite you to enter our $50 Cirque du Soleil Gift Card Giveaway! Be sure to tell us all about your experience with Cirque du Soleil productions and follow @LosTweens & @Los_Teens on Twitter. If you don’t have Twitter, check out the post on Facebook. Hi!!! We are a family of four and have NEVER been to a Cirque show!! We would be ecstatic to win this fun prize!!! Happy Holidays!! We have seen Cirque du Soleil La Nouba at Downtown Disney in Orlando and we really enjoyed it. i’ve seen La Nouba AGES ago and have been wanting to see another for a while. saw the Miami show and loved it!